Picture yourself in a futuristic world. You wake up and after your morning rituals, head to work. You have a presentation to deliver in Beijing, China by 10 am, Mineral inspection of your company's mine in Kenya by 12, lunch with a friend in Sweden and a business meeting in Australia before you can call it a day. The mind-blowing part? You do all of these from the comfort of your office in Manhattan. Extended Reality (XR) is the umbrella term given to all computer generated environments which encapsulate the physical features and offer awareness of the desired environment to provide a wholesome realistic user experience. Extended reality is the agglomeration of Virtual Reality, Augmented Reality and Mixed Reality. In Virtual Reality, a headset is used to introduce the user to a computer generated environment that engages the senses with realistic sounds and images. Mixed Reality blends both real and digital elements allowing the user to interact with generated objects. It is when we put all of these technologies together that we can have a broad EXTENDED REALITY. Extended Reality can be applied in so many industries such as Entertainment, Gaming, Marketing, Communication, Training, Real Estate, Remote Work etc..
GoFindXR is a platform that supports the idea of decentralized spatial representation of Geolocations on the internet. SImply put, GoFindXR aims to use the blockchain and Extended Reality to provide users with the opportunity to explore the world. With extended reality, we can bridge distances to access information, people, and experiences. You can easily become a part of the "XR web" by using Gofind’s XR Browsers for iOS and Android phones. GoFindXR has plans to develop their applications to work via smart glasses for the full user experience. Gofind has its own economy and virtual currency: XR Token. XR Token is used to register land and make transactions on the XR Web. Various applications including social media, games and shopping can be built on this new XR Land, it’s the new 3D Internet. 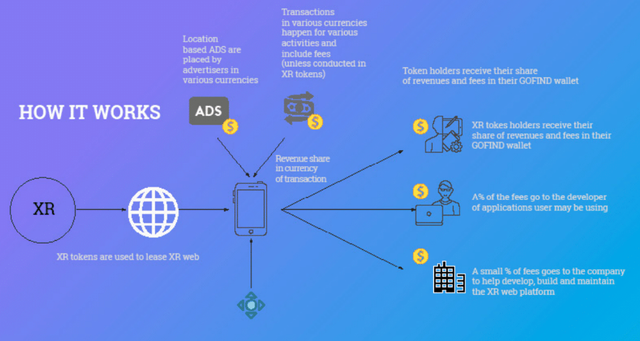 Using our XR tokens, investors and users can stake them to certain geographical locations and get a revenue share from ads or transactions in the applications from transaction fees and applications. GoFind is focusing on Virtual Real Estate. With these technologies, users can visit, experience, own and even lease properties on the XR web for profit. The use of the blockchain will ensure that users possess full control and security over their virtual currency, land ownership and assets, while content is duplicated and distributed across the IPFS network. Currently, the platform is running on iOS and Android devices that support AR frameworks with positional tracking, such as ARKit3 and ARCore.4. In the next article, we shall look at the integral features of the XR web and how it will use advanced technologies to transform our daily lives.